Thankfully enough, the Waschowski brothers only made us wait 6 months to get past the "To Be Concluded..." which left us hanging on the edge of our seats at the end of The Matrix Reloaded. I think I speak for everyone when I say that we were all confused as could be with the host of unanswered questions raised in the second film. In order to complete this trilogy, we needed answers and resolution from Matrix Revolutions. So, are questions answered? Is the war between man and machine over? The answer is...sort of. By the end of the film, I had a better feel for what was going on, and also felt like the war was over. However, not all of my questions were answered nor was there an absence of conflict between man and machine. For instance, one question I had was "how was Neo able to have special powers outside of the Matrix?" I don't think I got a clear answer, though there are several possibilities I might be able to dream up. As for the war, the fighting is over by the end of the film, but there are still many humans still held captive inside the Matrix. In Matrix Revolutions, we do learn that when Neo (Keanu Reeves) entered Agent Smith's (Hugo Weaving) body at the end of the original The Matrix, Agent Smith took on qualities from Neo, giving him enormous power. Agent Smith has become Neo's opposite, or alter ego. Can Neo defeat him? Agent Smith is one by one taking over the Matrix as he continues to clone himself. Furthermore, Agent Smith has found a way to cross over into the human world and has taken over Bane's existence. Thus Neo must battle Agent Smith in both worlds now. Meanwhile, the machine sentinels are making their way towards the underground fortress of Zion, the last human stronghold. Those who rely purely on numbers and probabilities know their resistance is futile and will only delay the inevitable. However, others have hope because of Neo and they put their faith and trust in him. As for the judgement of this as a movie on its own rather than as the final piece of a trilogy, I'd have to temper my enthusiasm. I love the Matrix trilogy and feel that all three are needed as pieces of a puzzle. However, the 3rd movie, on its own is not the best of the three. In fact, I'd probably rate it as the worst, although it is in good company, to be sure. The main reason for this is that it is, for the most part, a downer. Humans are attacked by vicious, unfeeling machines. Many of them die, including several main and popular characters. And, perhaps most obvious, is the fact that most of the film happens outside of the Matrix, which means that the super-hero-like stunts and action scenes that seem to define these movies are few and far between. Another disappointment I had in this one is the lack of time spent with one of the most powerful and important characters of the trilogy...Morpheus (Laurence Fishburne). He hardly has anything to do or to say in this one, which is a shame for his screen time is usually quite compelling. However, the logic and philosophies of Matrix Revolutions is sound. What is shown and what is explained makes sense, for the most part. Although, the only truly unbelievable part was in trying to get us to believe that there is a such thing as a good woman driver. Niobe (Jada Pinkett Smith) is touted as the best driver in the fleet and it is her driving that plays a major part in the battle between man and machine. Come on man! Good woman drivers don't exist! HAHA. Just kidding...or am I? What is quite fascinating to me are the Christian parallels in this movie. Now sure you could argue that this is my own interpretation and that it says more about me than about The Matrix, but I'd argue back that these parallels are unmistakable. First and foremost is the rather obvious imagery shown when Neo sacrifices himself inside the Matrix; back in the machine "source" he is stretched out in the shape of a cross. Neo's self-sacrifice is enough to end the war, and to give life to humans. It also pays the ransom for anyone still left in the Matrix, but only for those who want to get out. This is much like the Christian belief that Jesus' death and resurrection are enough to save anyone who believes in Him, but is not a blanket which covers everyone. However, regardless of religious parallels and philosophical ideologies, this movie definitely shares with us some unequivocable truths. The first one that really sticks in my mind is the power and fearlessness of love. Trinity (Carrie-Anne Moss), along with Morpheus and Seraph (Sing Ngai) enters the Merovingian's lair in perhaps the movie's best scene as she seeks the release of Neo. The Merovingian wants to make a trade, placing a very high price on Neo's head. Trinity speeds things along when she maneuvers to wind up holding a gun against his head. "Either you'll give us Neo or we all die right here and right now." The Merovingian (Lambert Wilson) can't understand how this could happen...how someone would be willing to end their own life in this way. "She's in love" is the explanation that his lady Persephone (Monica Bellucci) gives him. We see other examples of how love can motivate one to risk danger and death for another. This movie also shows us similar examples of hope and of faith. However, the over-riding philosophy promoted in this movie (and in the other two) is that of our freedom of choice. We choose to love, we choose to have faith or to hope, and we can choose to save the world. Towards the end of this movie, Neo lets Agent Smith know that "It ends tonight." And he is right. I really enjoyed the ending of this wonderful trilogy full of philosophy, intricacy, and ground-breaking special effects. 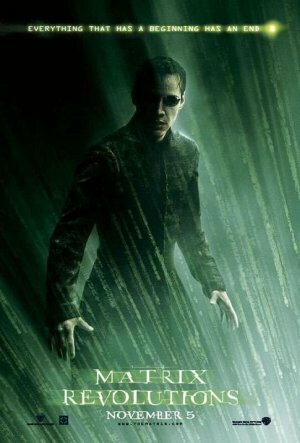 How would you rate the movie Matrix Revolutions? There have been 12052 people to visit this page since Mon, Nov 10, 2003. And you are the first person to visit this page today!